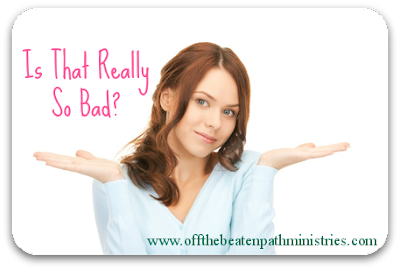 Off the Beaten Path: Jealousy - Is That Really So Bad? Jealousy - Is That Really So Bad? People often tell me I look good in green. I have light green eyes, and supposedly they look even greener when I sport a dark green sweater or shirt. But no one, including me, looks smart or cute in the putrid green of jealousy. And I hate to have to report this to you, my friend, but I've been stubbornly decked out in that very same gross green as of late. I've been jealous. And I haven't just been seething with jealousy on the inside; I've been acting on it, living in it, speaking out of it, and even eating on it! Shoot, I've been swimming in the dark green cesspool of jealousy and I wreak with it's pungent odor. I'm so glad we're friends and I can tell you that. It's awful, I know. Is a little jealousy really all that bad? To be honest, when I first caught a glimpse of myself sporting the green garb of jealousy in the mirror, I didn't really think it looked all that bad on me. So what if I resented someone a little, longed for what they had, and pouted because I didn't have what they were enjoying? But little by little jealousy began to eat me up from the inside out. Jealousy does that, you know. It stirs up feelings of emptiness, boils over into resentment, and eventually burns and devours your relationships. First Corinthians 13:4 reminds us that love has nothing to do with jealousy. If we love, we will not only refrain from treating the other person with jealous actions, but we will not even allow the seeds of jealousy to take root. How do you keep jealousy from taking root in your life? Good question; I'm working on that. I hate the sick feeling my jealousy left me with. While it may "feel good" to wallow in the cesspool of jealousy for a little while; there is no joy in swallowing the stuff. And eventually, if you're swimming around in it, you will swallow it! Count your own blessings every day...multiple times a day, if necessary. "Give thanks in everything, for this is God’s will for you in Christ Jesus." 1 Thessalonians 5:18. The list will be long! Thank God for the blessings you see in other peoples' lives. See 2 Thessalonians 1:3. Be glad for others! Persist in thinking on truth. Don't let your mind wonder into the area of half truths, lies, and maybes. See Philippians 4:8 and dwell on "these things." Be aware of God's unique work in your own life. Realize that He gives you exactly what you need in order to do the good work He has begun and will complete in your life. Your life is "made to order." Ask God to help you resist the temptation of jealousy. The Bible tells us there is no temptation that Jesus also did not face, but He overcame each one. It also tells us that there is always a way of escape...even from the green tentacles of jealousy. So ask God to show it to you...and run! Is jealousy really all that bad? Yeah, it really is. Take it from me, you don't want to go there. Jealousy, like all other sins, is a destroyer...of dreams, families, ministries, friendships, careers, churches and joy. This is one green garment you don't want to wear!